In The Moment, originally uploaded by biffybeans. Later this week, for the 3rd year in a row, I'll be heading to Loretto, PA to participate in Jim Donovan's Rhythm Renewal Workshop. Jim Donovan was the drummer and one of the founding members of the band Rusted Root. Having moved on from Rusted Root, Jim now teaches music at St Francis University in Loretto, PA. He also travels locally to teach drumming workshops that are centered around world percussion and the djembe. I've lost count of how many of his workshops I've attended. My favorite is a workshop called "The Yoga of Drum and Chant", which uses simple drum patterns and vocal toning (chanting) to help you find your center, balance your energies, and to be more in the moment. I've taken so much from his teachings and have applied them to my every day life. It's really good, good stuff. I did this painting last year, during one of the amazing faculty jam sessions at Rhythm Renewal. 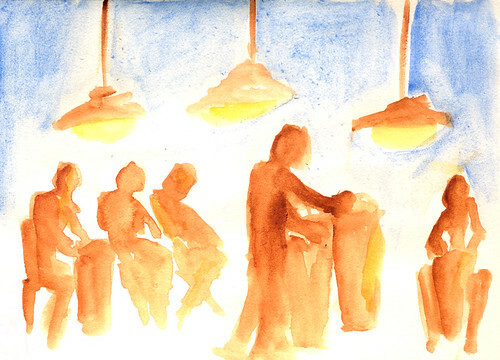 I had taken a small palette of watercolors and a waterbrush and did this piece in a 4x6 sketch pad. 063008 And this is my Reality. Elemental Mandala Doodle, originally uploaded by biffybeans. I write all the time, so I finally decided to resurrect the Blogger account I created but never used. Hopefully now, I can get all my thoughts in one place. For my 1st official 2008 post, I'd like to present the first of many mandalas to come. 063008 And this is my Reality. I've been getting a lot of questions lately about my mandalas. People asking what they signify, and if they are used for meditation purposes. 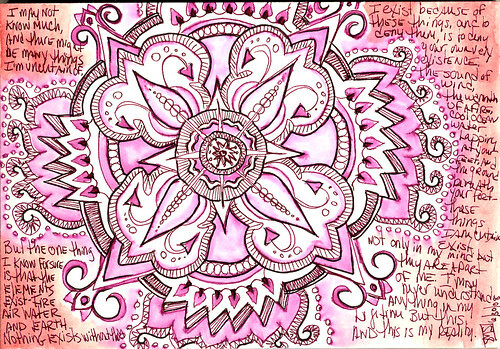 I once saw a hand-drawn mandala on Flickr, and it was described as a "Meditation Mandala." It was created in one sitting as a form of meditation. Since I generally have a hard time turning my mind off, I was quite intrigued with the concept, and started drawing mandalas from that point forward. 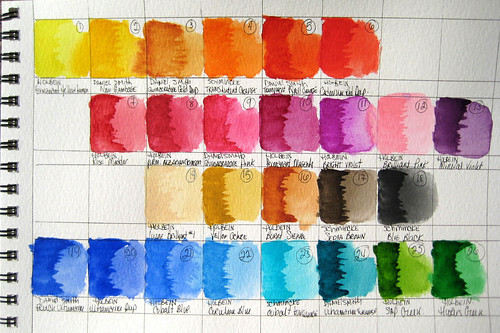 Using markers, watercolor paints, fountain pens and ink, pens, pencils, pretty much anything I can get my hands on. I usually create them in about an hour - such as this one. It's about 5x7 in size, and was done on Fabriano Hot Press Watercolor paper. I started to draw it with a Lamy Safari fountain pen filled with Private Reserve Burgundy Mist ink. I then grabbed a Niji Waterbrush, and painted the border a reddish brown. I accidentally got some of the ink lines wet, and I realized that I could use this to my advantage. All of the pink(ish) color you see was created by running the wet brush against the ink lines. I did a bit of outlining with a Pitt Artist pen, then went outside for a smoke. As I was sitting there with the painting in my hand, a cool summer's night breeze blowing across the porch - it made me remember that the only thing in life I am absolutely sure of is the earth and it's elements. "I may not know much and there might be many things I'm uncertain of, but the one thing I know for sure is that the elements exist. Fire, Air, Water and Earth. Nothing exists without them. I exist because of these things and to dent them is to deny your own existence. The sound of the wind, the warmth of a fire, cool ocean water lapping at your feet- these things I am certain exist. Not only in my mind but they are a part of me. I may never understand anything in my lifetime but this. And this is my reality."